In this article, you'll learn to handle strings in C. You'll learn to declare them, initialize them and use them for various input/output operations. In C programming, the collection of characters is stored in the form of arrays, this is also supported in C++ programming. Hence it's called C-strings. C-strings are arrays of type char terminated with null character, that is, \0 (ASCII value of null character is 0). How to define a C-string? In the above code, str is a string and it holds 4 characters. Although, "C++" has 3 character, the null character \0 is added to the end of the string automatically. C++ program to display a string entered by user. Enter another string: Programming is fun. Notice that, in the second example only "Programming" is displayed instead of "Programming is fun". This is because the extraction operator >> works as scanf() in C and considers a space " " has a terminating character. C++ program to read and display an entire line entered by user. Enter a string: Programming is fun. You entered: Programming is fun. To read the text containing blank space, cin.get function can be used. This function takes two arguments. First argument is the name of the string (address of first element of string) and second argument is the maximum size of the array. In the above program, str is the name of the string and 100 is the maximum size of the array. In C++, you can also create a string object for holding strings. 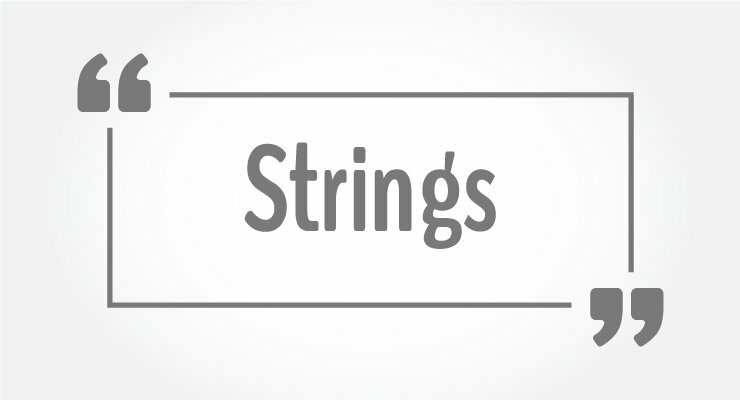 Unlike using char arrays, string objects has no fixed length, and can be extended as per your requirement. In this program, a string str is declared. Then the string is asked from the user. Instead of using cin>> or cin.get() function, you can get the entered line of text using getline(). getline() function takes the input stream as the first parameter which is cin and str as the location of the line to be stored. Strings are passed to a function in a similar way arrays are passed to a function. Enter a string:  Programming is fun. Entered string is: Programming is fun. Entered char array is: Really? In the above program, two strings are asked to enter. These are stored in str and str1 respectively, where str is a char array and str1 is a string object. Then, we have two functions display() that outputs the string onto the string. The only difference between the two functions is the parameter. The first display() function takes char array as a parameter, while the second takes string as a parameter. This process is known as function overloading. Learn more about Function Overloading. C++ Program to Remove all Characters in a String Except Alphabets.